Matt DeFouw was livid when his son brought home the worksheet. DeFouw provided a photo of the one-page “political spectrum” worksheet given to 10th graders at Valleyview Jr. 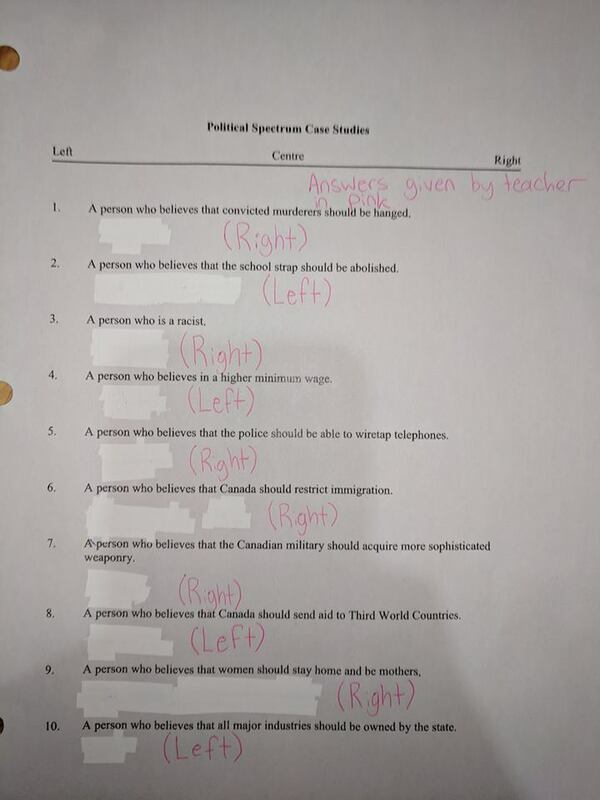 Secondary School in Kamloops, British Columbia — which, among other things, declared that racists are right-wingers. DeFouw said his son whited out his answers and wrote down the teacher-provided answers in pink. “My son has told me that the teacher directed ‘class discussion’ on these matters is even worse than this worksheet,” he added to his post on Oct. 1. What else is considered right wing? Convicted murderers should be hanged. Police should be able to wiretap telephones. The military should get better weapons. Women should be stay-at-home mothers. “This is what is being taught to our children,” DeFouw said. And what are left-wing views? The state should own all major industries. How did education officials respond? British Columbia’s education minister Rob Fleming called the worksheet “offensive,” Global News reported. The school district said DeFouw was satisfied with its response to the situation, USA Today said. Officials also launched investigations into the lesson’s context, CTV News said, adding that School District 73 no longer will use the worksheet.